With vibrant energy, outstanding acting and the grandeur of a movie, director Gregory Doran continues his journey through Shakespeare's First Folio of plays for the Royal Shakespeare Company (RSC) with the epic of Henry IV. The same ensemble of fine actors star across both Part I and Part II but the highlight is an exceptional performance by Antony Sher as Sir John Falstaff. He forms an endearing relationship with the audience while eloquently and steadily making Shakespeare's words flow as you imagine the bard would have wanted them spoken. Sher has embodied every facial expression, twinkle of the eye and shaky hand as the boozing, rotund, deceptive yet loveable knight. Sher's portrayal makes it easy to understand why the Prince of Wales, Prince Hal, would have been so drawn to a life in taverns and brothels with the lovable rogue and friend, rather than facing up to his staid responsibilities as the heir apparent. Henry IV Part I starts with the crowning of King Henry IV as the ghostly figure of long-haired Richard II dims out on a balcony. 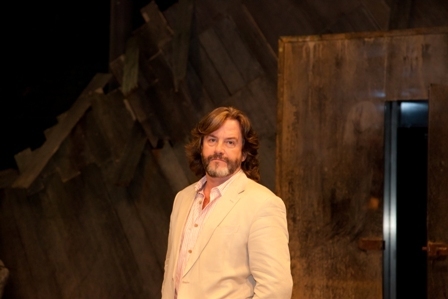 It's a nod to Gregory Doran's last RSC play starring David Tennant as King Richard. Meanwhile, the young handsome prince Hal is in bed with two women and barely clothed. 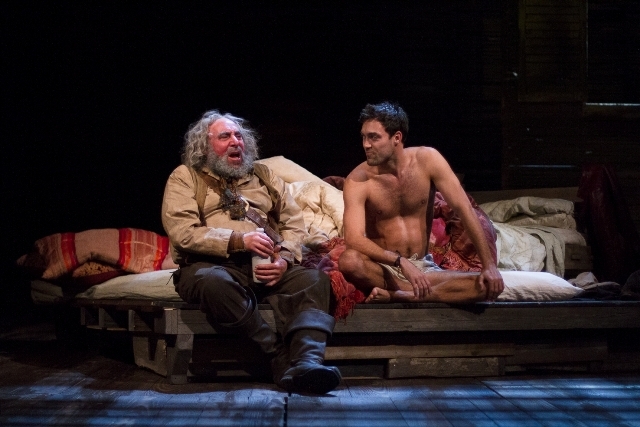 Actor Alex Hassell glimmers with vitality in the role and his wonderful chemistry with Sher's Falstaff is one of the key ingredients that make this production so special. It also adds to the emotional tug you feel as their relationship breaks down through the two plays. 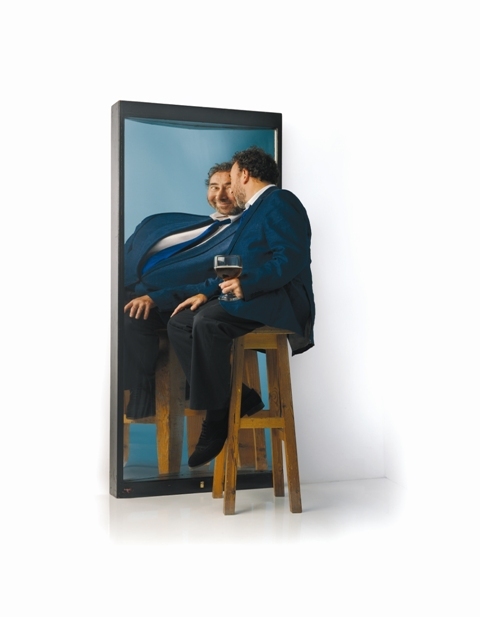 They transform from the closeness of a father and son in Part I to Falstaff being rejected in the finale of Part II. Much of these plays focusses on the relationship between fathers and sons and we see a symmetry between Hal and his father, the King, with the opposition - the Earl of Northumberland and his sprightly, impetuous son, Hotspur. Both fathers end up dragging their child by the ear in despair, and both sons show their immaturities in different ways. Ultimately it will be Hal and Hotspur who meet on the battlefield and decide the fate of the country. Director Doran has weaved in the essence of a blockbuster about the play too, which fits well with the productions being screened live from Stratford upon Avon to cinemas across the country on May 14 and June 18 respectively ahead of a UK tour that takes it to the Barbican Theatre in London from November 7, 2015, to January 24, 2016. The swordfights are action-packed and dramatic, like the sets themselves, which have candles burning, menacing hooded cloaked figures and a soundtrack to accompany the entrance of the king and more key moments. Part I is the more light-hearted of the two plays and is full of energy. Hal and Hotspur constantly run and jump around stage, hardly able to contain their excitement. Trevor White as Hotspur is a beguiling figure on stage - over-zealous, passionate and bubbling with anger and eagerness to fight. Then there's the hilarity of the escapades that Falstaff and his band of merry men get up to, in a slapstick fashion. While over in the opposition's camp, there's time for romance with their wives despite the clouds of war looming. It's an exciting, happy escapade on the whole and by the close of the play, you are on the edge of your seat wanting more. It's the perfect prequel that sets you up for what you know to be more gloomier times ahead. Meanwhile in Henry IV Part Two, the tone is far more serious as Prince Hal faces up to the responsibilities his position demands. But before that all gets under way, he have modern introduction from actor Antony Byrne in a Rolling Stones T-shirt reminding us that the key theme of this play is rumour. Twitter text of #rumour appears across a screen behind him and while it relates to the rumours from various camps of who has won or lost the war and rumours that the king is dead, it seems like an interesting way of reaching out to a younger audience. Returning to traditional dress, Part II kicks off and is instantly a far darker and sombre affair as the rebellion with its Welsh and Scottish allies is curtailed. Even jovial Prince Hal has lost his mirth as his father's health deteriorates and the future as a king dawns on him. Falstaff, as always, provides the light relief amid the gloom, as he ventures off to Gloucestershire to reminisce with old friend Justice Shallow (an excellent Oliver Ford Davies). He now also has a young child page in hand, who is an adorable addition to the cast. Antony Sher once again shines out from a strong cast. When Prince Hal casts him aside to become the honourable king, Falstaff's crestfallen face is heartbreaking and like a spurned lover in denial he mutters "he'll call, he'll call" - but we know he won't. This play is all about tying up loose ends. It seals Hals fate as well as Falstaff's and will leave you contentedly satisfied. It's another success for Doran as he works through Shakespeare's catalogue. Box Office 0844 800 1110 or from the RSC website. Barbican Theatre, London - November 7, 2015 - January 24, 2016 Box Office 020 7638 8891 or from the Barbican Theatre website.